Being an official nailpolishaddict and wearing nail polish 24/7 on my nails, choosing my top 5 for summer isn’t actually that easy. 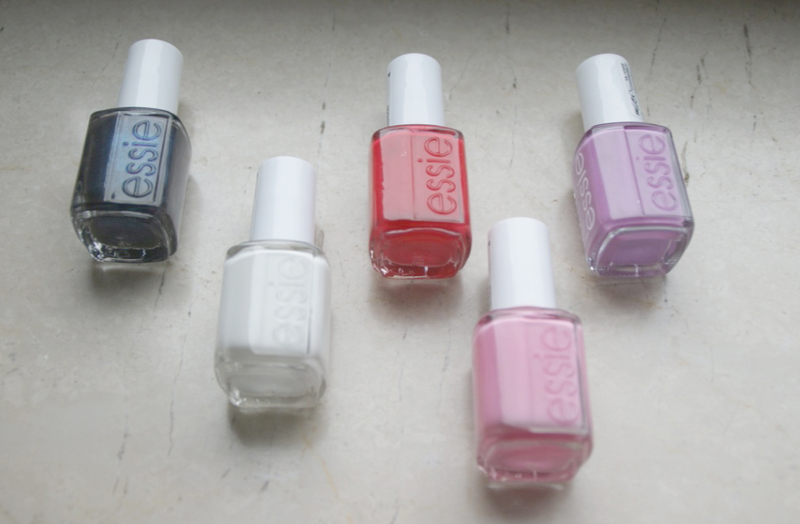 Essie polishes hardly ever chip on me and I can wear them for a full week, with the right base and top coat. For my record that’s pretty good.But let’s talk about the actual colours. My first one on the left is „Dive Bar“, a blue shade with a greenish undertone and a metallic sheen to it, which shows up in the sun really nicely. It’s a fun colour for summer that reminds me of the ocean and i do love a metallic here and there. Right next to it is „Blanc“, kind of a classic and staple peace in the nail polish world, but so versatile. I sometimes layer confetti top coats (like for example L’oréal) or other sparkling nail polishes to make the white pop even more. A bright red, with an orange undertone, called „Too Too Hot“ is my musthave red in the summer. A nice pop of colour that looks amazing on your nails with a tan on, or on paler skin, like mine.An also really popular colour from Essie „Lovie Dovie“ a girly light pink, and who doesn’t like some pink in the summer?It’s really opaque, especially for that light of a pink and makes me really excited for summer, even tough the weather here is not the sunniest right now..
And finally – drum roll – „Splash of Grenadine“. The mix of lilac and pink, how to describe this wonderful colour?, is one of my favourite nail polishes in general. It’s a beautiful colour that has a settle amount of glitter in it, which you can just see in the bright sun and looking really closely, but still. It’s a nice transition nuance from light spring shades to the summer ones and does look really pretty on your toes as well. Which are your favourite summer polishes? As an addict I would love to know and maybe try out some of them.